The who, what, when, where, why, and how of Black Streaks! Black Streaks, the scourge of any vertical surface. You read it right. Oh, you think because you own a Motorhome or Boat that you’re the only person that has to deal with Black Streaks. Well guess again. In fact, as you read on you will discover who gets Black Streaks and what makes them occur. You will also find out when to expect them and discover where they originate. Lastly, we will cover why they happen and how to combat them so the surface you’re looking to keep clean, stays cleaner longer. Anyone owning a vertical surface left in the open environment is susceptible to acquiring Black Streaks. Though they may not be prevalent on new surfaces, most smooth and semi-smooth vertical surfaces will get them. It is simply a matter of TIME. Yes that’s right — TIME. Streaks occur as a result of time and neglect. While it may seem as though your surface has been selected for special punishment, it is not so. Black Streaks do not discriminate from one vehicle or owner to the next. They do not care who you are, and in fact have only one goal — your frustration. The reality is that Black Streaks occur primarily as a result of moisture. So if you are in a moist environment you are more likely to have Black Streaks than those folks living in a dry climate. Now this does not mean actual precipitation. Moisture is in the air and collects as dew in the evenings. If you are in an area with evening dew then you should expect streaks. Black Streaks are also prevalent in areas with high air pollution. So if you live in a city with high population content you will be more likely to have streaks than folks living in the country. That is not to say that folks living in the country will not get streaks. If moisture content is high and the air has plenty of dust from either unpaved roads or trees, then you should expect streaks. To summarize, we can say that if you live in a dry climate with little to no air pollution or dust and you live away from paved or unpaved roads with traffic or dust, then it is safe to say that you will see far fewer Black Streaks than those folks living elsewhere. So the real truth is that you are going to get Black Streaks, and there is no stopping them. What makes a Black Streak? Black Streaks are the result of TIME and NEGLECT. Add to this, the accumulation of surface contaminants and moisture and you have the perfect formula for a successful Black Streak. If you want to know just what a Black Streak is, do this exercise. Step out into the open outdoors and take a deep breath, then — be sure to let it out. The very air we breathe is made up of, not only the gasses we need to keep us alive, but also millions of different particulates, matter, floating in the air. Many times we call these, pollutants. However, some of these items are naturally occurring and therefore cannot be referred to as pollutants. These include, but are not limited to; water, dust, plant spores and pollen just to name a few simple ones. The mixture of airborne particulate, we will call it dust, settles to a horizontal surface during the day. Then in the evening hours, after the sun goes down, the second part of this diabolical equation is put into place. 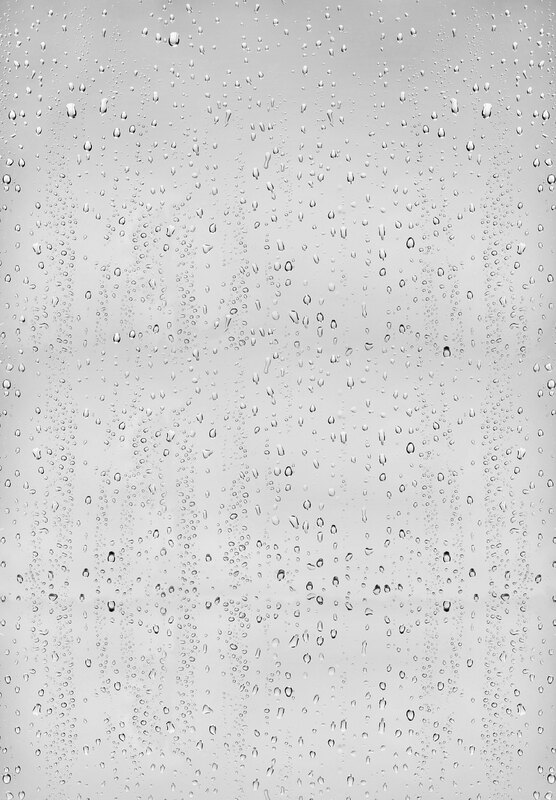 Moisture, normally occurring as dew, collects over the film of dust. At this point the process of gravity takes over. The water and dust mixture gains mass as the water collects. The mixture then takes the path of least resistance in an effort to reach the ground. During the slide to mother earth some of the mixture is left behind on the vertical surface as evidence of the trip. Mixed with the dust are remnants of the water. Calcium, lime and other minerals in the water and air are also deposited to the surface. In the early morning hours the sun comes up and the dew point breaks as the daylight warms the air. This causes the water in the mixture to evaporate ending the process and leaving behind the finished Black Streak. Each evening the process repeats and takes the path of least resistance using the path of many Black Streaks before. The layered build up is slow and takes time under the cloak of darkness. When would you expect a Black Streak? We have learned who gets Black Streaks and what makes them occur. So now we need to know when they occur so we can be prepared to combat them. As stated previously, Black Streaks begin their attack in the early evening hours. The attack is relentless, like the ticking of a clock, never stopping, as long as there is moisture and dust you will get Black Streaks. So keep in mind that they are regular when moisture and dust are present and less sever when they are not. Expect Black Streaks to become noticeable in one to three weeks under normal conditions. Expect them to be glaring in one to three months. Also understand that the process repeats each and every night. As time passes the dust and water mixture build up, and the Black Streak gets a better hold. This physical hold is especially good on an un-waxed or neglected, oxidized surface. We have learned that the process described previously tells us what a Black Streak is and when to expect them. What we need to know now is where they begin. As noted earlier, a Black Streak begins simply enough with the collection of dust and then moisture on a horizontal flat surface such as the roof of a boat or RV. They can also begin on something as small as the tiny flat surface on the top outside rim of a household gutter. Any flat surface can collect dust. So any attached vertical surface is subject to streaks. We can surmise that doing our best to keep the horizontal surface free from dust build up will help to minimize Black Streaks. Why do Black Streaks happen? As noted earlier in this article the main reason for Black Streaks are TIME and NEGLECT. Most people let way too much time pass between washes. A simple, regular, wash job, with products like Protect All Quick & Easy Wash, can be the end of most Black Streaks. The problem is that most people look at a large flat surface such as that of a Motorhome or Boat and think they would rather wash the car. They forget that many times the value of this large vehicle is way more than that of a car. So procrastination takes over. If you don’t look at it then you don’t see it. Then it’s too late. The Black Streak has a good hold and needs more than just gentle persuasion to let loose. How do we combat Black Streaks? Knowing what we now know, some simple thoughts come to mind. Prevention is a good place to begin. One way to help prevent streaks is to catch them before they happen using gutters. Yes RV and some marine applications can benefit from using simple plastic gutters attached to the top of a vertical surface. You will need to remember that even these gutters need to be cleaned from time to time. Next, how about a cover? If a cover can be made and used effectively then it is a good idea. Many people scoff at a cover because of cost or the challenge of use. The simple truth is in the math. A cover can average in cost from $1.00 – $3.00 per day and while it does take some time and effort to use, the payback is phenomenal. Think about it. Your arms and back are worth way more than $3.00 a day. So a cover works. Alternatively, though far more costly, is a garage. While many people do not have the room, either on their property or in their wallets, for a garage, it too works to minimize Black Streaks. Keep in mind that all of the above do not prevent Black Streaks. They only serve to minimize the occurrence. So now you have taken steps toward prevention. In addition, some simple tasks can also go a very long way toward continuing your efforts to beat Black Streaks. Since we know that dust and dew settle on horizontal surfaces we can attend to them regularly. A simple sweep of the roof on a monthly basis will help loads. Now that does not mean get up on the roof and sweep it off. That means, wait for the area to be completely dry and use a soft bristle broom and dustpan to collect the accumulation. Put that into a can or bag and take it to the trash. Doing so will help prevent moving the dust and dirt from the roof to the side of the vehicle. Consider waxing this horizontal surface if it is fiberglass or painted aluminum with a product like Protect All, Polish Wax and Treatment. Consider a treatment that leaves a dry waxed finish, such as Protect All Rubber Roof Treatment, if the roofing is rubber or vinyl. This step will minimize the way dust sticks to the surface making your monthly sweeping easy. Now we can say with conviction that regular and routine appearance maintenance will work wonders. Remember, you paid a bundle for that thing and there it sits, collecting the very thing that you will eventually have to work to remove. BLACK STREAKS! Don’t you think a wash job at least once every 3 months is a good idea? Don’t you think that a regular wax job is a good idea? Regular washing and waxing helps to remove Black Streaks before they get good and stuck. A good regular wax job helps to prevent Black Streaks in the first place. A good layer of wax will help to minimize the way Black Streaks set into the surface. Waxing creates a physical barrier across the surface. This barrier helps the surface shed the water and dust mixture. A wax that produces an anti-static, slick, finish, like Protect All Polish Wax and Treatment, will perform the task of shedding the mixture better than those made solely for appearance. Once you have a good wax on the surface, check periodically for new streaks. If a reapplication of wax to the affected are does not do the trick then it is time for a Black Steak Cleaner or Remover, such as Protect All Black Streak Cleaner & Degreaser. 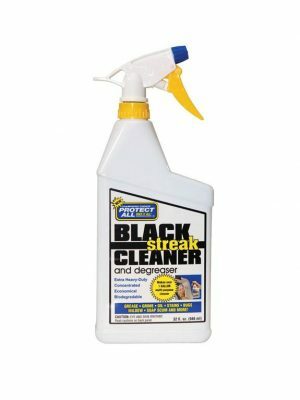 The Black Streak Cleaner or Remover is your last resort. These are very strong cleaners even though many find some that do not work completely. If you decide to use a Black Streak Cleaner or Remover use it as directed in the instructions. 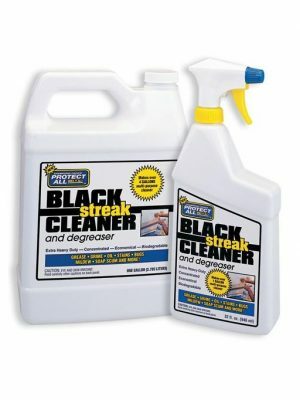 The best way to use a Black Streak Cleaner or Remover is to spray the product into a towel and attack the streak directly. This simple action of applying physical contact to the surface along with the cleaner is far better than a spray of cleaner and a quick rinse. The spray and splash method seldom works. It is also important to understand that these cleaners WILL strip wax from the surface. So it is important to re-wax the area where you have used a Black Streak Cleaner or Remover. So now you have washed and used a Black Streak Cleaner or Remover but you still see a bit of the old streaks. The steaks have successfully oxidized onto the surface. You will need to treat these areas as you would any oxidized surface. Many products in the market today address oxidation, either on fiberglass or paint. Be sure to choose the product that is correct for your surface. Be sure to read and follow the directions before you begin so that you get the best results. Once the surface has been deoxidized be sure that it is re-waxed. Some current products that address oxidation do so by using one step. Products like Protect All Fiberglass Oxidation Remover and Color Restorer, remove the oxidation, polish the surface smooth and flat, and then leave behind a wax finish, thereby eliminating the need to re-wax. Be sure to read the label so you get the product that is right for you. Whatever you do, be sure to wax regularly. A simple coat of wax done once every three months or so will go a long way toward beating Black Streaks. Now that you are aware of the, who, what, when, where, why, and how of Black Streaks you are well prepared to both tackle them and help prevent them. Do keep in mind that nothing will stop them altogether. Only regular and routine maintenance will make them manageable.